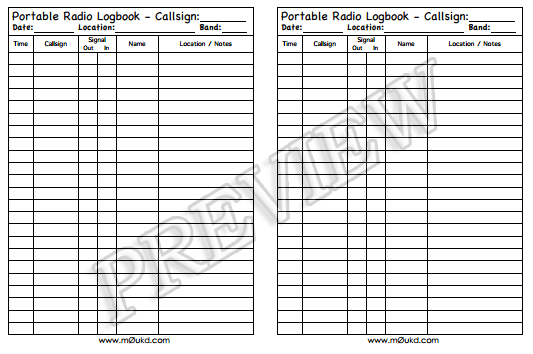 Below are some printable logbooks (or logsheets) which I made to use whilst operating portable, such as SOTA. 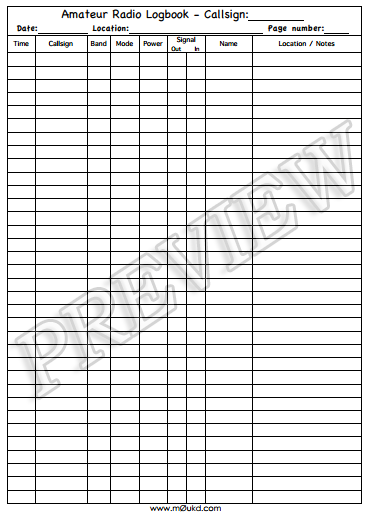 They are available in PDF format, for you to print on to A4 paper. The portrait version includes three extra columns compared to the landscape version, which are band, mode and power. The landscape version however has a section at the top for band. Both have sections at the top for callsign, date and location. The final one is designed for contest work with columns for serials exchanged and the name column is omitted. 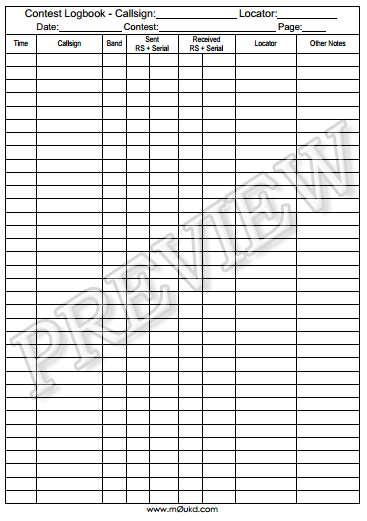 Landscape logbook with 46 entries, 23 per side. Can be cut into 2 or folded. Includes spaces for callsign, date, band and location at the top of each page. Columns are: Time, Callsign, Signal, Name, Location / Notes. Portrait logbook with 34 entries. Includes spaces for callsign, date, location and page number at the top of each page. Columns are: Time, Callsign, Band, Mode, Power, Signal, Name, Location / Notes. Contest logbook with 34 entries. Includes spaces for callsign, locator, date, contest and page number at the top of each page. Columns are: Time, Callsign, Band, RS + Serial sent, RS + Serial received, locator, other notes. I downloaded your portable logbook, well designed! Thanks Jim, I’m glad you found them useful! Hope to work you on HF sometime. UFB design PORTABLE for SOTA and CONTEST for today (2015/09/04) VHF contest. Thanks for the nice comment Randy! NICE. CLEAN AND WELL DESIGNED AID. I notice your logbooks don’t include frequency – do you make a note of that or don’t find it important? You include Band so I guess that is sufficient. Thank you very much for the very well designed logbooks! This saves me hours of making my own. Keep up the good work! Welcome, glad they are of use!